Description: This two day course held at Stourhead (Weston) Estate, Stourton, near Mere and the Rushmore Estate on the Wiltshire/Dorest border is offered by SelectFor Ltd. The course provides an in-depth introduction to the theory and practical application of irregular silviculture in coniferous and broadleaved stands with the emphasis on lowland forests. The course is designed for 14 trainees and will be led by Andy Poore and David Pengelly. The two day course costs £330+VAT per person. For further details see the attached booking form or contact David Pengelly. Description: The Wales visit was to Bryn Arau Duon managed by Phil Morgan and Huw Denman. 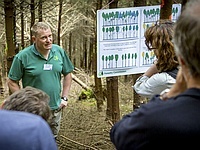 Bryn Arau Duon is a fascinating example of how the principles of continuous cover forestry can be applied in what most British foresters would normally consider to be clearfelling territory; an upland, even-aged Sitka spruce plantation. CCFG last visited Bryn Arau Duon in 2009. A full report will be available in due course. Follow links to the handout, Schutz Curves Scenarios, harvesting summary, rack spacing, working circles map and bad working circles as were discussed on the day. Description: We celebrated CCFG’s 25th anniversary with an evening dinner at The Castel Hotel in Llandovery. Guest speakers, Philippe Morgan, President of Pro Silva Europe and Jurij Diaci of the University of Ljubljana discussed the challenges of the next 25 years. See the presentation delivered by Jurij Diaci and the presentation delivered by Phil Morgan. Description: This meeting was held in Glenbranter Forest, Cowal and involved visits to some of the finest stands of old conifers in the British Isles. The morning was spent at Pucks Glen, the afternoon at Dukes Wood and the roundup at Ritual Grove. A full report will be available in due course. Description: 49 delegates from all across Europe enjoyed three days in Scotland visiting forests around Aberfoyle, Native Pinewoods in the Spey Valley and Craigvinean and Faskally Forests. The report from Pro Silva is now available. Description: The 2016 England Field Visit was held on Thursday the 2nd of June 2016 in Norfolk. The morning was spent at Weasenham Estate courtesy of Toby Coke and the afternoon was at Sennowe Park courtesy of Tom Cook with picnic lunch at Sennowe Park. An extract of a case study produced by Scott Wilson has been kindly provided to give some initial insights. A report will be made available in due course.